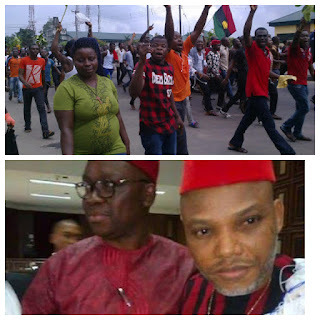 The secession group, The Indigenous People Of Biafra (IPOB), has conferred The Ekiti State Governor, Dr Ayodele Fayose with the tittle of honorary governor of Biafra republic. According to IPOB, this in recognition of his solitary to their leader, Nnamdi Kanu and show of courage at the court sitting in Abuja, where the IPOB leader was granted bail. The group also commended former aviation ministers, Osita Chidoka and Femi Fani-Kayode, Profs Chukwuma Soludo and Pat Utomi, Senators Ike Ekweremadu and Enyinnaya Abaribe and others for their support in the release of its leaders. In a statement signed by the media and publicity secretary of the group, Comrade Emma Powerful, it says; We also acknowledge the immense contributions of the honorary Biafran Gov. Ayodele Fayose who did what no South East or South South governor had the courage to do.